I was recently taking some online courses on software development best-practices courtesy of Coursera. In these courses they would use the phrase ‘beautiful code’ to describe well-written software code. This means that the software is written in a fashion that is efficient and not bloated. Microsoft Vista, for example, was the epitome of NOT beautiful code because it was slow, had limited native hardware support and not enough compelling innovation. On the contrary, Salesforce.com and Box.com are two excellent examples of beautiful code where the User Interface is feature-rich and useful. Additionally, the software is quick to respond and is highly available to the user in a ubiquitous fashion, from any device, anywhere at any time – especially with the user experience optimized for mobile devices. From a computing standpoint I happen to personally think that Document Imaging is the ‘beautification’ of the computing communication technology stack. Let me explain. When a particular technology is so good for so many different reasons, this is what makes Document Imaging/ECM and Capture so beautiful. This technology allows businesses to reduce labor costs associated with information management. It affords organizations the luxury of sharing electronic files and helps to assist with compliance and regulations. Document Imaging is one of the best ways to have a solid disaster recovery plan which is beautiful. It’s simply beautiful that people’s lives are enriched to do other activities such as attend your children’s sporting events, spend a night at the movies with your loved ones or just relax at the pool reading your favorite book instead of doing mundane tasks such as manual data entry or looking for lost documents. Computer networks are the collection of many different technologies that come together to do “something”. The OSI Model is a way in which the various components and/or protocols can be described and these components are mostly just taken for granted these days, it just simply works. We don’t need to worry ourselves about things such as TCP/IP, DNS or IPv6. It just happens. The technology has evolved to a point we can focus on getting value from these communications networks. 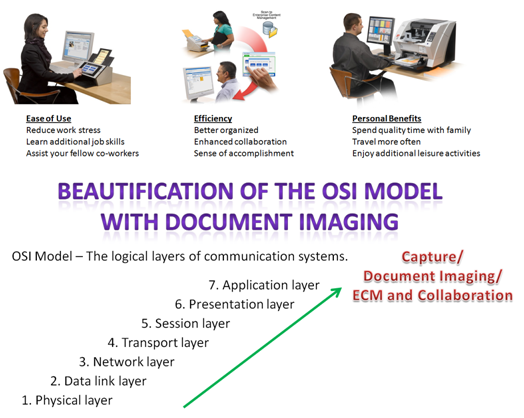 So when Document Imaging is applied as an application that brings all these components together and brings true value to networked systems, this really is a beautiful thing. The benefits of applying Document Imaging within organizations can be clearly measured in tangible financial return on investment such as in the case of AutoNation’s 13-month ROI on their nationwide distributed scanning deployment. Or sometimes the financial benefits are less of a motivation such as the case is with Care Ambulance’s scanning deployment where they placed scanners inside of ambulance’s and created an integrated capture and communication solution. In this case, the primary motivation of the project was to provide the highest level of patient care possible and capturing timely, as well as accurate, information was critical to this project. This is simply beautiful now that the emergency medical technicians (EMTs) can now focus a maximum amount of the time and efforts on caring for their patients instead of dealing with paperwork. Therefore, that’s why as an industry we should be so passionate about promoting our technology. Creating beautiful code for a software application is a great thing, but applying technologies such as document capture and ECM to a communication network is remarkable to enrich people’s lives. Do you think that technology can be beautiful? Do you have a story to tell of how beautiful technology enriched your personal life?